"Five Boroughs" redirects here. For the Mercian area of this name during the tenth and eleventh centuries, see Five Boroughs of the Danelaw. New York City, in the U.S. state of New York, is composed of five boroughs. They are Manhattan, the Bronx, Queens, Brooklyn, and Staten Island. Each borough is coextensive with a county of New York State. The county governments were dissolved when New York City consolidated in 1898, along with all city, town, and village governments within each county. If the boroughs were each independent cities, four of the boroughs (Brooklyn, Queens, Manhattan, and the Bronx) would be among the ten most populous cities in the United States; these same boroughs are coextensive with the four most densely populated counties in the United States (New York [Manhattan], Kings [Brooklyn], Bronx, and Queens). The term borough was adopted to describe a form of governmental administration for each of the five fundamental constituent parts of the newly consolidated city in 1898. Under the 1898 City Charter adopted by the New York State Legislature, a "borough" is a municipal corporation that is created when a county is merged with populated areas within it. This system, in which New York City's borough governments are inferior to the powers of the city-wide government, differs significantly from borough forms of government used in Connecticut, New Jersey and Pennsylvania, in which a borough is an independent level of government, as well as other borough forms used in other states and Greater London. New York City is often referred to collectively as the five boroughs; the term is used to refer to New York City as a whole unambiguously, avoiding confusion with any particular borough or with the Greater New York metropolitan area. The term is also used by politicians to counter a frequent focus on Manhattan and thereby to place all five boroughs on equal footing. In the same vein, the term outer boroughs refers to all of the boroughs excluding Manhattan, even though the geographic center of the city is along the Brooklyn–Queens border. All of the boroughs were created in 1898 during consolidation, when the city's current boundaries were established. The Bronx originally included parts of New York County outside of Manhattan that had previously been ceded by neighboring Westchester County in two stages; in 1874 and then following a referendum in 1894. Ultimately in 1914, the present-day separate Bronx County became the last county to be created in the State of New York. The borough of Queens consists of what formerly was only the western part of a then-larger Queens County. In 1899, the three eastern towns of Queens County that had not joined the city the year before—the towns of Hempstead, North Hempstead, and Oyster Bay—formally seceded from Queens County to form the new Nassau County. The borough of Staten Island was officially the borough of Richmond until the name was changed in 1975 to reflect its common appellation, while leaving the name of the county unchanged as Richmond. Manhattan (New York County) is the geographically smallest and most densely populated borough and is home to Central Park and most of the city's skyscrapers. Manhattan's (New York County's) population density of 72,033 people per square mile (27,812/km²) in 2015 makes it the highest of any county in the United States and higher than the density of any individual American city. Manhattan is the cultural, administrative, and financial center of New York City and contains the headquarters of many major multinational corporations, the United Nations Headquarters, Wall Street, and a number of important universities. Manhattan is the borough most closely associated with New York City by non-residents; residents of the New York City metropolitan area, including natives of New York City's boroughs outside Manhattan, will often describe a trip to Manhattan as "going to the City". Manhattan is often described as the financial and cultural center of the world. Most of the borough is situated on Manhattan Island, at the mouth of the Hudson River. Several small islands are also part of the borough of Manhattan, including Randall's Island, Wards Island, and Roosevelt Island in the East River, and Governors Island and Liberty Island to the south in New York Harbor. Manhattan Island is loosely divided into Lower, Midtown, and Uptown regions. Uptown Manhattan is divided by Central Park into the Upper East Side and the Upper West Side, and above the park is Harlem. The borough also includes a small neighborhood on the United States mainland, called Marble Hill. Marble Hill was originally part of Manhattan Island, but is now contiguous with the Bronx after having been severed from Manhattan Island by the construction of the Harlem River Ship Canal south of the neighborhood, and having been connected to the mainland by the subsequent filling in of the Harlem River's original path to the neighborhood's south. New York City's remaining four boroughs are collectively referred to as the outer boroughs. Brooklyn (Kings County), on the western tip of Long Island, is the city's most populous borough. Brooklyn is known for its cultural, social, and ethnic diversity, an independent art scene, distinct neighborhoods, and a distinctive architectural heritage. Downtown Brooklyn is the only central core neighborhood in the outer boroughs. The borough has a long beachfront shoreline including Coney Island, established in the 1870s as one of the earliest amusement grounds in the country. Marine Park and Prospect Park are the two largest parks in Brooklyn. Staten Island (Richmond County) is the most suburban in character of the five boroughs. Staten Island is connected to Brooklyn by the Verrazano-Narrows Bridge and to Manhattan by way of the Staten Island Ferry, a free commuter ferry and popular tourist attraction which provides unobstructed views of the Statue of Liberty, Ellis Island, and Lower Manhattan. In central Staten Island, the Staten Island Greenbelt spans approximately 2,500 acres (10 km2), including 28 miles (45 km) of walking trails and one of the last undisturbed forests in the city. Designated in 1984 to protect the island's natural lands, the Greenbelt comprises seven city parks. The Bronx (Bronx County) is New York City's northernmost borough and the only New York City borough that is part of the United States mainland. It is the location of Yankee Stadium, the baseball stadium of the New York Yankees, and home to the largest cooperatively owned housing complex in the United States, Co-op City. It is also home to the Bronx Zoo, the world's largest metropolitan zoo, which covers 265 acres (107 ha) and houses over 6,000 animals. Pelham Bay Park is the largest park in New York City, at 2,765 acres (1,119 ha). Each borough is represented by a borough president. Brooklyn, Queens, and Staten Island each have a Borough Hall. The Manhattan Borough President's office is situated in the Manhattan Municipal Building. The Bronx Borough President's office used to be in its own Bronx Borough Hall but has been in the Bronx County Courthouse for decades. Since the abolition of the Board of Estimate in 1990 (due to a 1989 ruling of the U.S. Supreme Court), the borough presidents have minimal executive powers, and there is no legislative function within a borough. Executive functions in New York City are the responsibility of the Mayor of New York City, while legislative functions reside with the New York City Council. The borough presidents primarily act as spokesmen, advocates, and ceremonial leaders for their boroughs, have budgets from which they can allocate relatively modest sums of money to community organizations and projects, and appoint the members of the 59 largely advisory community boards in the city's various neighborhoods. The Brooklyn and Queens borough presidents also appoint trustees to the local public library systems in those boroughs. Because they are counties, each borough also elects a district attorney, as does every other county of the state. While the district attorneys of Manhattan, Brooklyn, and Staten Island are popularly referred to as such by the media (e.g., "Manhattan D.A. Cyrus Vance, Jr.", or "Brooklyn D.A. Kenneth P. Thompson"), they are technically and legally the district attorneys of New York County, Kings County and Richmond County, respectively. There is no such distinction made for the district attorneys of the other two counties, Queens and the Bronx, since these boroughs share the respective counties' names. Because the five district attorneys are, technically speaking, state officials (since the counties are considered to be arms of the state government), rather than officials of the city government, they are not subject to the term limitations that govern other New York City officials such as the mayor, the New York City Public Advocate, members of the city council, or the borough presidents. Some civil court judges also are elected on a borough-wide basis, although they generally are eligible to serve throughout the city. The term sixth borough is used to describe any of a number of places that have been metaphorically called a part of New York City because of their geographic location, demographics - including large numbers of former New Yorkers, special affiliation, or cosmopolitan character. They have included adjacent cities and counties in the New York metropolitan area as well as in other states, U.S. territories, and foreign countries. In 2011, New York Mayor Michael Bloomberg referred to the city's waterfront and waterways as a composite sixth borough during presentations of planned rehabilitation projects along the city's shoreline, including Governor's Island in the Upper New York Bay. The Hudson Waterfront in the U.S. state of New Jersey lies opposite Manhattan on the Hudson River, and during the Dutch colonial era, was under the jurisdiction of New Amsterdam and known as Bergen. Jersey City and Hoboken in Hudson County, New Jersey, are sometimes referred to as the sixth borough, given their proximity and connections by rapid transit PATH trains. Fort Lee, New Jersey, in Bergen County, opposite Upper Manhattan and connected by the George Washington Bridge, has also been called the sixth borough.Miami and nearby areas in Florida, Philadelphia and China are locales entirely outside the city's metropolitan area which have been called New York City's sixth borough. 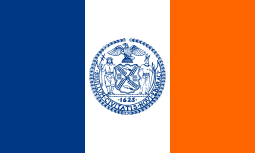 ↑ The Charter for the Greater New York, and Acts Supplementary Thereto, as Adopted by the State Legislature, p. 10. Brooklyn Daily Eagle, 1898. Accessed September 21, 2016. ↑ Bacharach, Jacqueline; and Barrales, Ruben. Growth Within Bounds, p. 197. California Commission on Local Governance for the 21st Century, DIANE Publishing, 2000. ISBN 9780756706319. Accessed September 21, 2016. ↑ "Current Population Estimates: NYC". NYC.gov. Retrieved December 6, 2016. ↑ Williams, Keith. "How Queens Became New York City's Largest Borough", Curbed , October 20, 2015. Accessed September 21, 2016. "Williams, Keith. "How Queens Became New York City's Largest Borough", Curbed , October 20, 2015. Accessed September 21, 2016. "On April 28, 1898, the state Legislature approved the creation of a new county, which some in the eastern half of the former Queens County had wanted for nearly 60 years." ↑ Kaufman, Michael T. "Council Weighs Making 'Staten Island' Official", The New York Times, August 28, 1974. Accessed September 21, 2016. "Yesterday a committee of the City Council sought to right matters with a resolution that, if adopted by the full Council and approved by the Mayor, would have the borough's name officially changed to Staten Island.... The resolution only affects the name of the borough. The county would remain Richmond, in the way that the borough of Manhattan is the county of New York, and Brooklyn is the county of Kings." 1 2 Christine Kim, Demand Media. "Queens, New York, Sightseeing". USA TODAY. Retrieved March 20, 2016. 1 2 Andrew Weber (April 30, 2013). "Queens". NewYork.com. Retrieved March 20, 2016. ↑ Mann, Camille; Valera, Stephanie. "10 Most Crowded Islands in the World". The Weather Channel. Retrieved March 28, 2016. ↑ Purdum, Todd S. "Political memo; An Embattled City Hall Moves to Brooklyn", The New York Times, February 22, 1992. Accessed November 26, 2016. ""Leaders in all of them fear that recent changes in the City Charter that shifted power from the borough presidents to the City Council have diminished government's recognition of the sense of identity that leads people to say they live in the Bronx, and to describe visiting Manhattan as 'going to the city.'" ↑ Barry, Dan (October 11, 2001). "A Nation challenged: in New York; New York Carries On, but Test of Its Grit Has Just Begun". The New York Times. Retrieved March 27, 2016. A roaring void has been created in the financial center of the world. ↑ Sorrentino, Christopher (September 16, 2007). "When He Was Seventeen". The New York Times. Retrieved March 27, 2016. In 1980 there were still the remains of the various downtown revolutions that had reinvigorated New York's music and art scenes and kept Manhattan in the position it had occupied since the 1940s as the cultural center of the world. 1 2 Joe Dorish. "10 Largest Parks in New York City". ZipfWorks, Inc. Retrieved March 20, 2016. ↑ O'Donnell, Michelle (July 4, 2006). "In Queens, It's the Glorious 4th, and 6th, and 16th, and 25th ...". New York Times. Retrieved July 20, 2014. ↑ Frazier, Ian (June 26, 2006). "Utopia, the Bronx". The New Yorker. Retrieved September 1, 2008. ↑ "Bronx Zoo Animals & Exhibits". Wildlife Conservation Society. Retrieved March 20, 2016. ↑ Board of Estimate of City of New York v. Morris, 489 U.S. 688 (1989). ↑ Popik, Barry (January 24, 2006). "Sixth Borough (Yonkers, Scarsdale, Fort Lee, Jersey City, Hoboken, Nassau County, Rockland County)". Big Apple. Retrieved 2013-05-01. ↑ Carlsen, Jen (December 10, 2010). "Poll: Where is New York's 6th Borough?". Gothamist. Retrieved 2013-05-01. ↑ "Mayor Bloomberg and Speaker Quinn Unveil Comprehensive Plan for New York city's Waterfront and Waterways" (Press release). NYCEDC. March 14, 2011. Retrieved 2013-05-01. ↑ Rovzar, Chris. "Mayor Bloomberg Attempts to Rebrand the 'Sixth Borough'". New York Magazine. Retrieved November 28, 2012. ↑ Mainland, Alex (February 18, 2011). "A Blog for the 'Sixth Borough'". The New York Times. Retrieved 2013-05-01. ↑ Yeh, Richard (March 14, 2011). "City Reclaims Waterfront as 'Sixth Borough'". WNYC. Retrieved 2013-05-01. ↑ "Sixth Borough Stories from New York's Waterfront". Columbia School of Journalism. 2011. Retrieved 2013-05-01. The sixth borough. That's what Mayor Bloomberg calls the 578 miles of shore land that encircle the five boroughs of New York City. ↑ Cunningham, Ryan A. (January 22, 2012). "Will NYC have a 6th Borough?". Metropolis Magazine. Archived from the original on February 8, 2013. Retrieved 2013-05-01. ↑ "Studio Report The Speculation Studio: Governors Island, The Sixth Borough?". Urban Omnibus. January 11, 2012. Retrieved 2013-05-01. ↑ Strunsky, Steve (December 9, 2001). "CITIES; Bright Lights, Big Retail". The New York Times. ↑ Holusha, John. "Commercial Property / The Jersey Riverfront; On the Hudson's West Bank, Optimistic Developers", The New York Times, October 11, 1998. Accessed May 25, 2007. "'That simply is out of the question in midtown,' he said, adding that some formerly fringe areas in Midtown South that had previously been available were filled up as well. Given that the buildings on the New Jersey waterfront are new and equipped with the latest technology and just a few stops on the PATH trains from Manhattan, they become an attractive alternative. 'It's the sixth borough', he said." ↑ Belson, Ken (May 21, 2007). "In Stamford, a Plan to Rebuild an Area and Build an Advantage". The New York Times. ↑ Olear, Greg (December 2002). "The Sixth Borough A good look at Hoboken". The Copperator. Retrieved May 1, 2013. ↑ Lefkowitz, Melanie. "Bergen County's Fort Lee: Town With a View". The Wall Street Journal. April 30, 2011. Accessed September 16, 2012. ↑ Linh Tat (June 12, 2012). "Fort Lee grapples with questions on future development". North Jersey Media Group Inc. Retrieved September 16, 2012. ↑ Vera Haller (September 7, 2012). "Living In Fort Lee, N.J. Close to the City, but With a Life of Its Own". The New York Times. Retrieved September 16, 2012. ↑ "More New Yorkers relocating to Philly". The Morning Call. March 29, 2015. Retrieved August 27, 2016. ↑ Andrew J. Hawkins (April 30, 2015). "Brooklyn businesses head for the sixth borough: China". Crain's New York Business. Retrieved August 27, 2016.